Soft and pillowy gluten-free snickerdoodles. 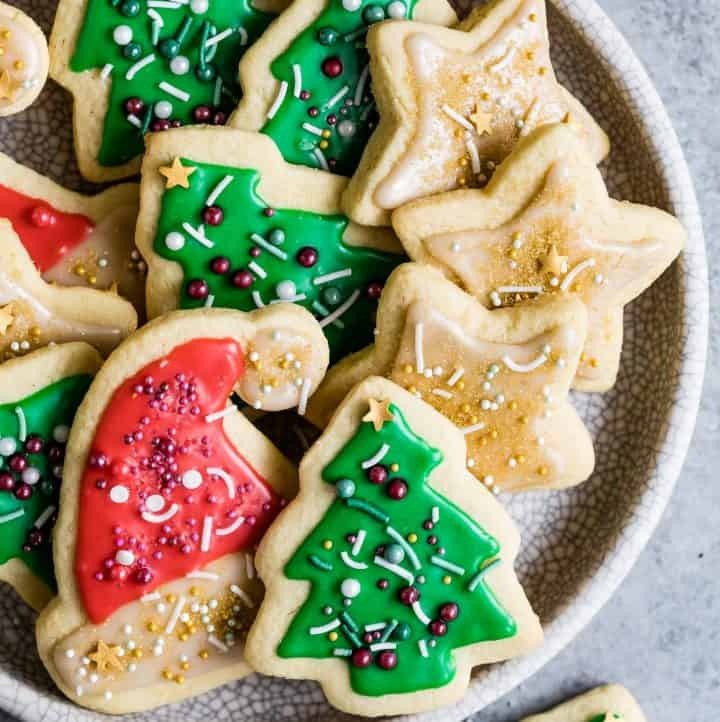 With a slightly crisp cinnamon-sugar coating and the classic cracked tops, these make the perfect cookie to dress up any holiday cookie plate. What was your favorite cookie growing up? In truth I liked all cookies (unless they had sweetened shredded coconut in them, in which case, get out of here). But my one true love was snickerdoodles. I don’t recall ever making them at home, so every time I ate a snickerdoodle it felt like a rare treat. 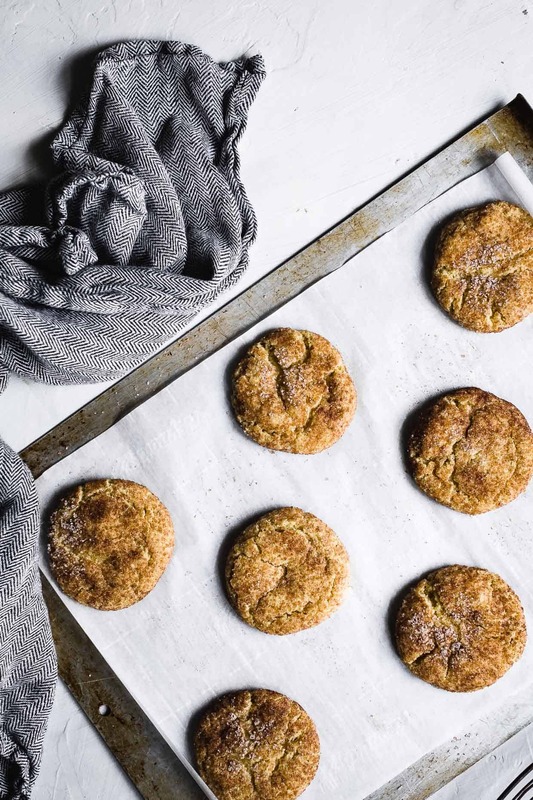 That soft pillowy cookie enveloped in a cinnamon-sugar coating is pure bliss. 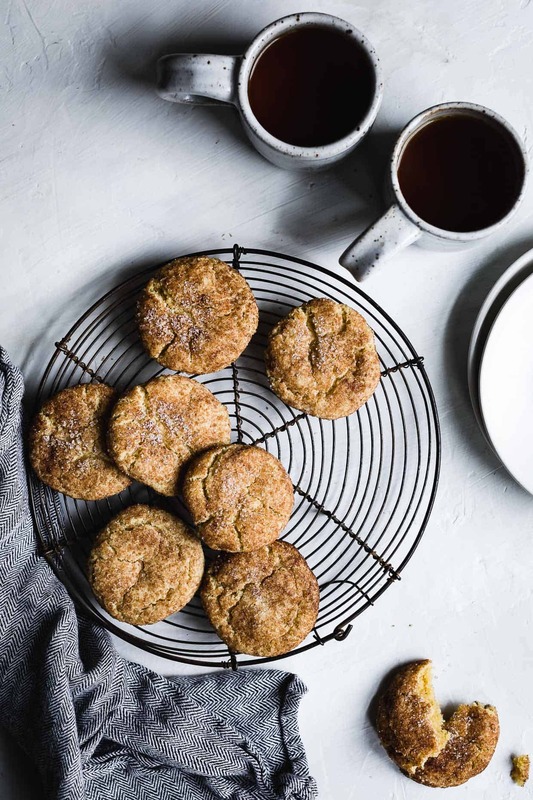 I’ve been honing my gluten-free snickerdoodle recipe since last January and now that cookie season is in full force again, I’m finally sharing the recipe. There will be purists that insist these are not snickerdoodles. Classic snickerdoodles must have cream of tartar, they say. It’s what gives the cookies their soft texture and unique tang. 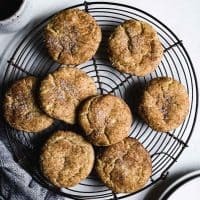 And while that may be true for traditional snickerdoodles, I’ve made this gluten-free recipe many times, both with and without cream of tartar. All my taste testers unanimously agree that this non-cream of tartar version is the best. 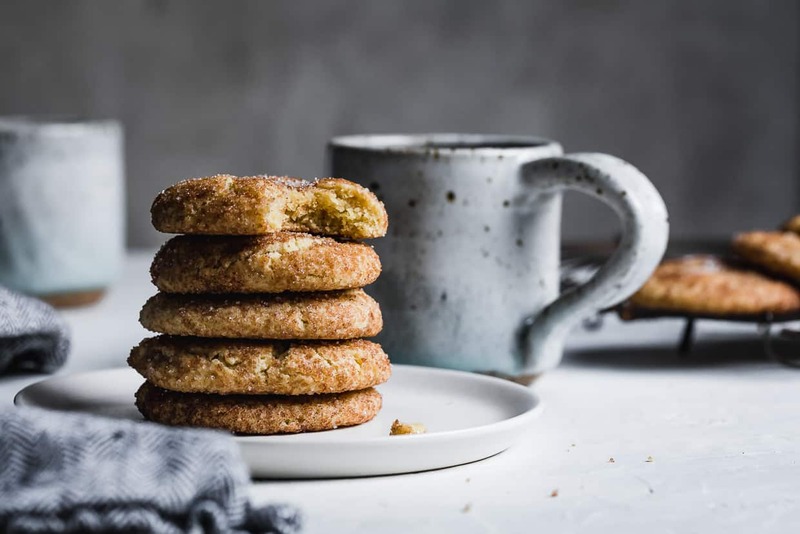 The only perceivable difference is the texture, with this version softer and fluffier, more like classic snickerdoodles, without any flavor compromise. My best guess is that gluten-free flours are just more flavorful than all-purpose flour, which masks the taste effect of cream of tartar. You can add a teaspoon of cream of tartar if you insist, but your cookies will be thinner. Whatever you decide, just don’t chill the dough near the stinky cheese in your refrigerator. Consider this your friendly holiday PSA. Last week, I packed up an ice chest to head to my parents’ house for Thanksgiving, quickly stacking my wrapped frozen pie crust I’d made a few weeks earlier on top of a robust round of Bonne Bouche at its peak ripeness. It all got transferred to my parents’ fridge in the same order and when I pulled out the pie crust the next day to roll it out? It was now also a robust stinky pie crust. I charged ahead, hoping the smell would bake off. Bake it did. Every time I opened the oven to check on the molasses pecan pie, a stinky cheese aroma wafted through the kitchen. My family swore it didn’t taste like cheese, but I opted for a slice of pear persimmon pie instead. Best to store your piquant cheese away from your dough. I’ve been keeping a permanently refilled batch of snickerdoodle cookie dough balls in my freezer (far from the cheese) for midnight cookie emergencies. 10/10 would recommend this practice. This gluten-free version is soft and pillowy with the classic cracks on top and every-so-slightly crisp cinnamon-sugar blanket. They’ll dress up any holiday cookie plate, becoming a fan favorite of all your neighbors. My gluten-free snickerdoodles are also kicking off Rodelle’s holiday month of cookies by the dozens! Check this page each day for more recipes to add to your holiday cookie plate. 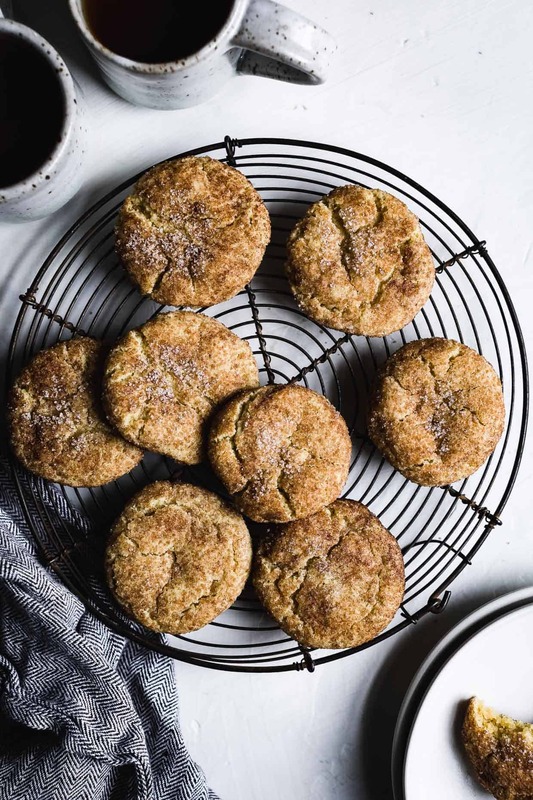 Pssst: I hear one my favorite bloggers, Tessa from Salted Plains, is also making a gluten-free snickerdoodle – can’t wait! 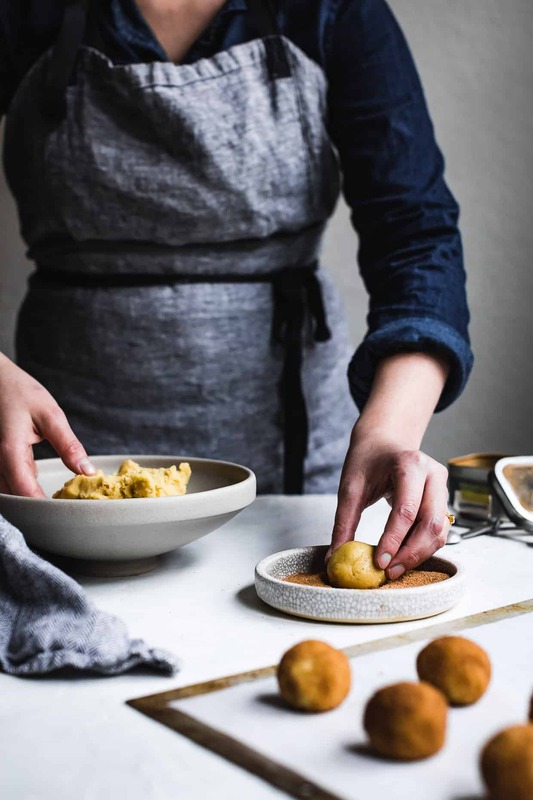 In a medium bowl, whisk together the almond flour, millet flour, tapioca starch, baking soda, and salt. Set aside. In a stand mixer fitted with a paddle attachment or in a medium bowl with a hand mixer or wooden spoon*, cream the butter and sugar together on high speed until light and fluffy, 2-3 minutes. Add the eggs and vanilla to the creamed butter and beat on medium speed until just combined. Slowly add the dry ingredients to the butter and eggs, beating until the flour is just completely combined. In a small bowl, mix the sugar and cinnamon coating together. 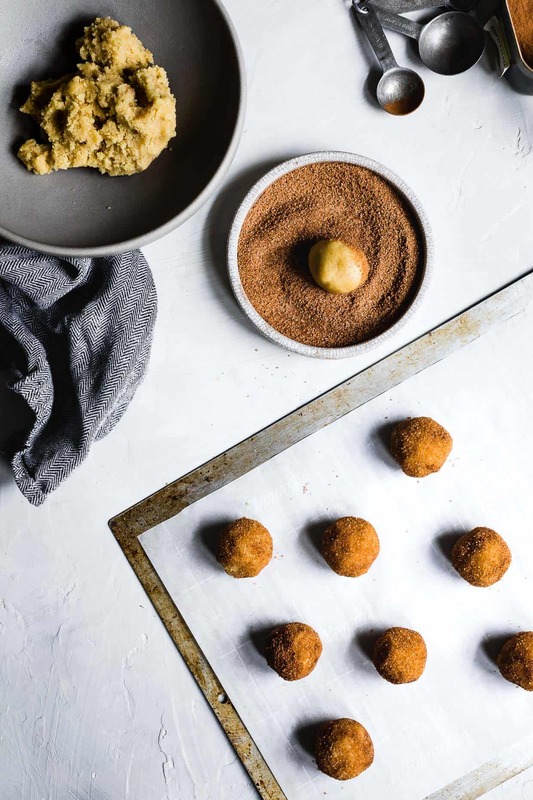 Roll 1-2 tablespoon-sized balls of dough into a ball, roll each cookie ball in the cinnamon sugar, and place on a parchment-lined baking sheet. Repeat until you've used all the cookie dough. Transfer the baking sheet to the freezer while you preheat the oven (or, if you don't have room in your freezer, chill for 30 minutes to an hour before preheating the oven). Bake the cookies 2-inches apart on a baking sheet for 11-13 minutes, until set, but still very soft. (See note below). Let cool for 3 minutes on the baking pan before transferring to a wire rack to cool completely. No mixer, no problem: I've made these cookies by hand without a mixer of any sort and they work just great! Baking time: For me, 12 minutes is perfect. I've had my oven calibrated, but every oven is slightly different, so if you've got the time, I recommend baking one test cookie and letting it cool for a few minutes. The cookies will look and feel under baked when they first come out of the oven and will firm up as they cool. If you cook them too long, they won't be as soft and chewy and will quickly become cake-like then crispy. After over-baking them a few times while testing, I put in my notes "TRUST 12 MINUTES!" Ohh I love these little cookies! I’m not a cookie purist, so I love that these have sugar and spice and everything awesome! I stand with Alanna. 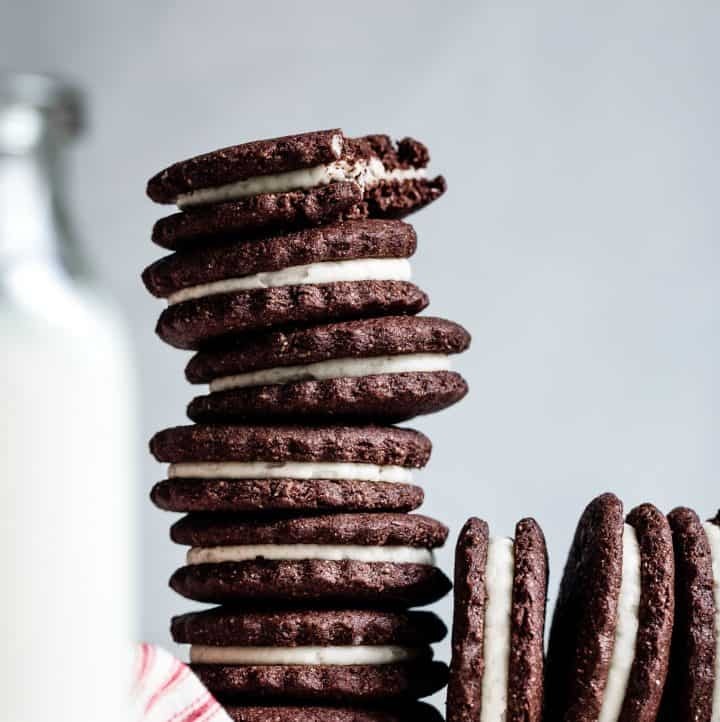 These cookies are PERFECT, and I usually am suspicious of gluten free cookies (Never yours though, obviously ;) And seriously, THANKS for the tip about the dough and stinky cheese. TOTALLY something I would do. “Forge ahead!” haha! Love the idea of gluten free version and, of course, your photos just urge me to try doing these beauties ! Thank you so much ! Oh my, it’s been too long since I’ve had a snickerdoodle. These look absolutely pillow soft, perfectly sweet and you’ve captured them so beautifully, Sarah! I was never picky as a kid when it came to cookies… but most of the cookies I ate came from a slice and bake log or a package – a far cry from homemade! But as an adult, anything chocolate chunk or short bread. 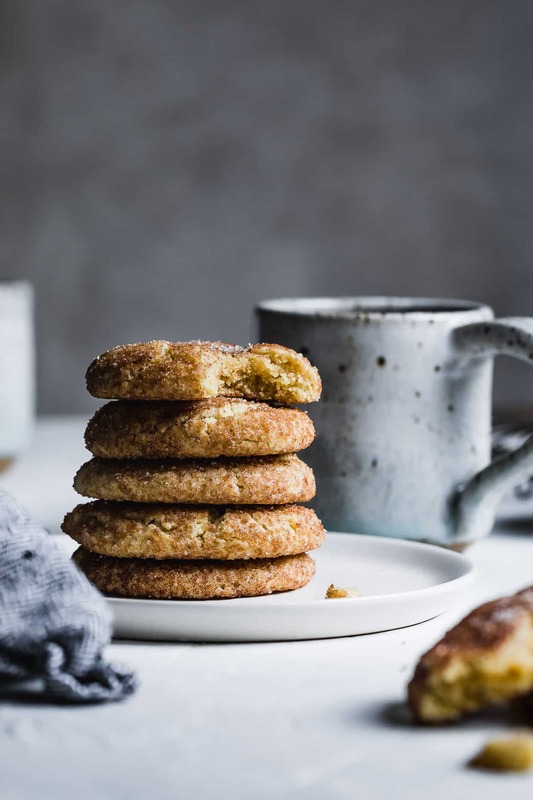 But it’s easy to forget about how fabulous snickerdoodles are… seeing these makes me long for a giant one – the kind you can get at Pike Place Market in Seattle! Delicious work, Sarah! Wahoo! My first true success! I’m following Bojon Gourmet and after a problem with millet flour Bob’s Red Mill suggested I try again. Alanna pinned this just as I needed a recipe with millet and baking soda instead of baking powder (searching out bitter flavor). These turned out exactly as you describe. I’m so encouraged. I cannot eat any of the gluten substitutes out there so I’m so happy to find a few of you don’t depend on them. Thank you!